이남기 교수 연구실에서 김재열 박사, 김철희 학생 주도로 리포좀 부착을 통한 단일분자 형광 분석을 통해 나노미터 수준의 단백질의 구조 변화를 밀리초보다 빠른 시간 분해능으로 실시간 관측하는 기술을 개발하였다. 이 결과는 2015년 4월 24일 Nature Communications 지에 온라인 발표 되었다. 연구팀은 개발된 기술을 이용하여 DNA repair 단백질의 동역학을 서브-밀리초 분해능으로 실시간 분석하는 데 성공하였다. 본 기술은 기존의 단백질 구조 동역학 연구보다 10~100 배 빠른 현상을 관측할 수 있다. Single-molecule fluorescence resonance energy transfer (smFRET) is one of the powerful techniques for deciphering the dynamics of unsynchronized biomolecules. However, smFRET is limited in its temporal resolution for observing dynamics. Here, we report a novel method for observing real-time dynamics with submillisecond resolution by tethering molecules to freely diffusing 100-nm-sized liposomes. 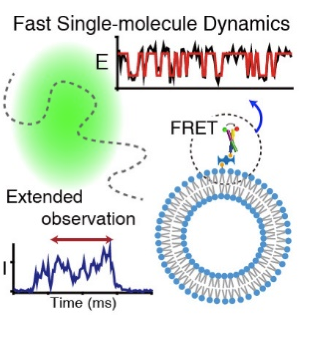 The observation time for a diffusing molecule is extended to 100 ms with a submillisecond resolution, which allows for direct analysis of the transition states from the FRET time trace using hidden Markov modelling. We measure transition rates of up to 1,500 s–1 between two conformers of a Holliday junction. The rapid diffusional migration of Deinococcus radiodurans single-stranded DNA-binding protein (SSB) on single-stranded DNA is resolved by FRET, faster than that of Escherichia coli SSB by an order of magnitude. Our approach is a powerful method for studying the dynamics and movements of biomolecules at submillisecond resolution.